The purpose of this page is to give exact advice to the basic-strategy player on when to surrender. When the tales show a total of 16, this refers to either a 10+6 or 9+7 total. The situation of two eights has a separate row when surrender is appropriate. Late surrender means that the player may surrender his hand and lose half his bet only after the dealer checks for blackjack. The following basic strategy tables show when to surrender (Y=yes, N=no) depending on the player's total, dealer's up card, and the number of decks. 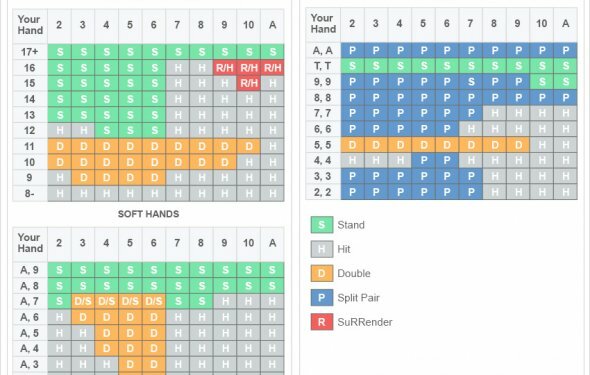 The right two columns represent a dealer ace according to whether the dealer stands (S17) or hits (H17) a soft 17. Exact card composition of the player's hand can sometimes make it advantageous to deviate from the basic strategy tables above. The following tables show when exactly to surrender given the player's total, dealer's up card, and number of decks. If the dealer has an ace up then the strategy often depends on whether the dealer hits (H17) or stands (S17) on a soft 17. *: In a double-deck game, when the dealer hits a soft 17, surrender 8+8 vs. A only if double after a split is not allowed. Early surrender is a seldom found rule in which the player may forfeit his hand and half his bet before the dealer checks for blackjack. The strategy is different from late surrender only when the dealer has a ten or ace showing. Following is a list for when to take early surrender against a dealer 10 or ace, regardless of the rules, except as noted. Dealer ace Vs. pair of 3's, 6's, 7's, or 8's. Dealer 10 Vs. pair of 7's or 8's. Surrender dealer ace against pair of 2's if dealer hits soft 17. Do not surrender 8, 8 vs 10 in single deck when double after split is allowed. What is early surrender in Blackjack? Early surrender is when a player surrenders before the dealer checks for a Blackjack.